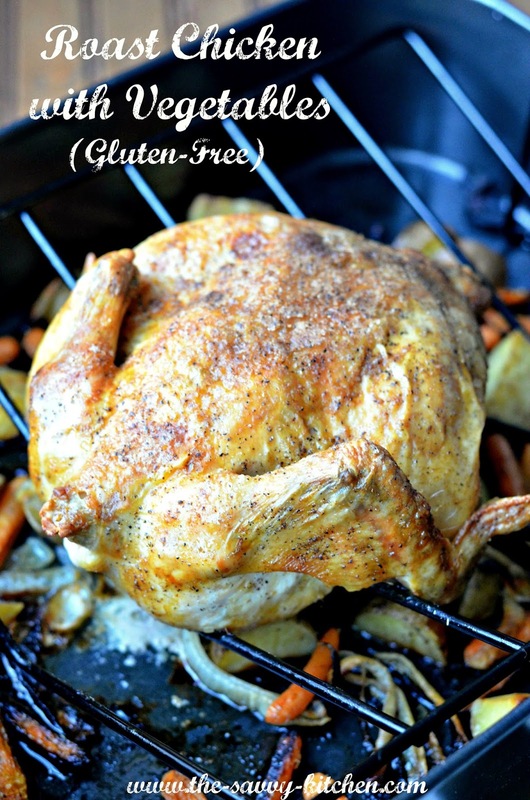 I love making roast chicken at home for a few reasons. Second, you only have to dirty one pan when preparing it. Third, it only takes ten minutes to prepare. Fourth, you can plop it in the oven and in one hour you have a moist, delicious meal ready for the whole family. Seriously! Throw some vegetables in the bottom of the roasting pan and you have all you need for a full dinner. Oh and fifth, leftovers! We always have leftovers and I use those to make a sandwich the next day, or chicken salad, taquitos, quesadillas. Whatever my little heart desires! So nothing is wasted. The bird really does turn out extremely tender with super crispy skin. This is both low-carb and low-calorie, so it fits most diet restrictions. 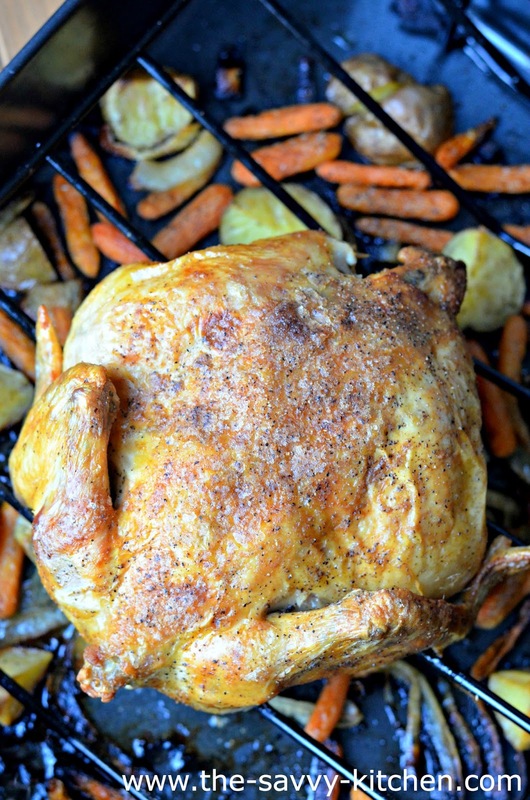 No need to rush out to the store next time you need a roasted chicken…just whip one up yourself! I promise it probably won't even be as expensive and it will taste just as good. Enjoy! Place the onions, carrots and potatoes in a roasting pan. Toss with salt, pepper and olive oil and arrange vegetables in an even layer. Add the rack on top of the roasting pan. Remove the chicken giblets. Rinse the chicken inside and out. Pat dry with a paper towel and place on the roasting rack. Salt and pepper the inside of the chicken. Add the thyme, lemon juice and garlic to the cavity. Brush the outside of the chicken with the butter. Sprinkle with additional salt and pepper. 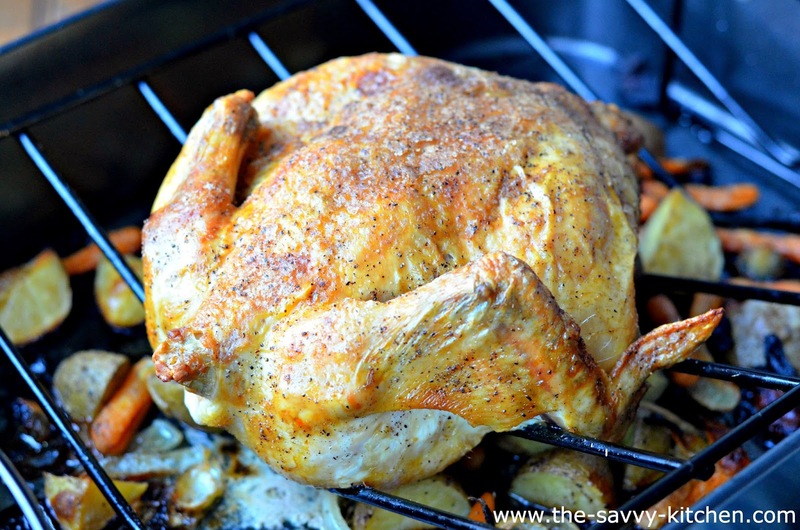 Roast the chicken for 1 hour and 15 minutes, or until the juices run clear when you cut between a leg and thigh. Remove the chicken and vegetables to a platter and cover with aluminum foil for about 20 minutes. Slice the chicken onto a platter and serve it with the vegetables.